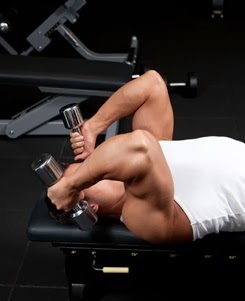 ➊ Lie on your back on a bench and hold a dumbbell in every hand, palms facing up, higher arms inform the ceiling. ➋ Raise the dumbbells by extending your elbows and permit them to slowly come when a brief pause. ➌ Keep your higher arms still throughout.